A white outdoor security camera is installed on a dark brown wall. Chances are good that it can be easily spotted by invaders and become the next vandalized target. 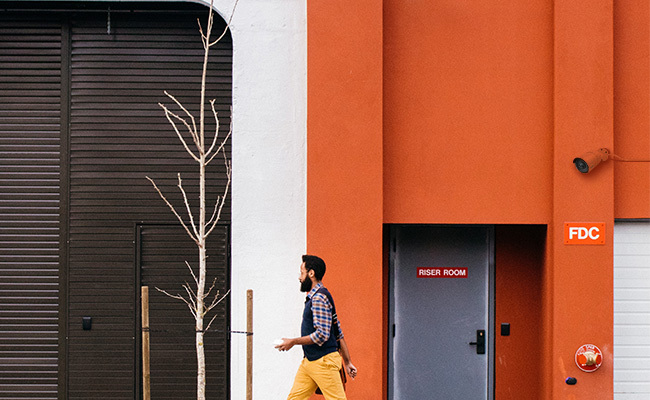 Fortunately, you can make it less noticeable by painting the security camera black, brown or other colors to fit in the surroundings. In addition to this solution, we will share with you extra tips to camouflage white IP cameras, and also the professional views on whether painting CCTV cameras will affect their performance or not. Many security cameras for sale nowadays come with a white appearance. However, such white security cameras may stand out and won’t blend in with the existing colors around your home. A survey on security camera vandalism shows that 16% of users have found their security cameras being vandalized very often or to a somewhat extent. To avoid such a problem, you can adopt some methods, like painting white CCTV cameras black or other camouflage colors, to make them inconspicuous. Trash thrown at your yards, driveways taken by others and plants cut by neighbors, such things can be a real headache. After painting white outdoor IP cameras black, you are able to figure out these mysteries with concealed CCTV cameras. So, next time when you face the same issues, you will be able to catch the intruders, annoying neighbors and even trespassing kids in the act and confront them with the recordings as strong evidence. In addition, you may also paint security cameras black for aesthetics reason. By adapting the color of security cameras to fit in the surroundings, you are able to make those outdoor IP cameras subtler against your home decoration and their surroundings. To paint your white security cameras black, you can simply apply spray and oil-based paint pens on the surface. For example, a Youtuber has converted a black outdoor IP camera into a green one. And it looks good! To avoid any bad effects on the night vision or motion sensing of your security cameras after the painting, you’d better seal their lenses, charging ports and audio ports tightly in advance. Removeable tapes will be very helpful to protect the important parts. Before painting, you also need to clean the surface of the white outdoor CCTV cameras with dry microfiber cloths to get rid of oil, dust and other items that could interfere with adhesion. To ensure that the painting materials stay on your security cameras as long as possible, roughen the surface a little bit and clean up the surface again when you begin. Also, to provide better adhesion and reinforce the performance of the paint materials, you may apply a coat of paint bonding prime with high-quality Nylon or Polyester brushes, small porous rollers or airless sprays on the white outdoor IP cameras and leave it to dry for 30 minutes before painting. Then you will be ready to paint the white security cameras black. After applying each layer of the sprays, it is best to leave it to dry for 15 minutes before the next coat and alternatively, you can also apply another layer of topcoat to keep colors from fading. If the painted outdoor security cameras are exposed to the sunlight directly, they will absorb extra heat and the colors will fade away very soon. To avoid such problems, you can install the IP cameras with painted materials under the eaves or soffits. Since the spray-painting outdoor security cameras are exposed to the air, sun and rain, their colors will eventually fade. But if you install security cameras under shelters and apply painting sprays properly, the black paint coat will last 12 months or even longer. When the paint fades, you may follow the procedure, tape everything around the outdoor IP cameras and paint them again. In fact, there are far more solutions to camouflage outdoor white CCTV cameras other than painting them black. A possible and feasible way is to hide security cameras to make them less conspicuous. Ideal spots for you to disguise security cameras include eaves, soffits, trees, birdhouses, black boxes and so on. 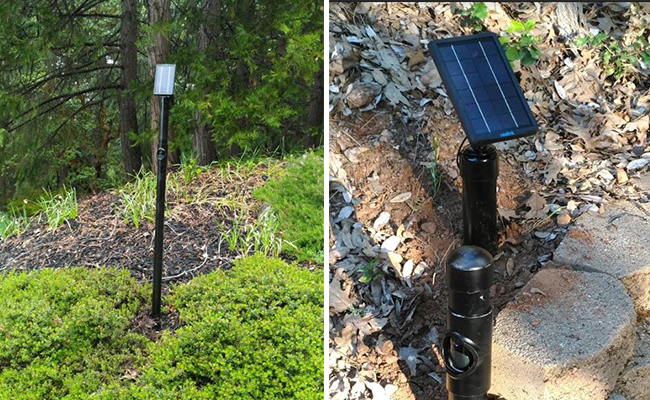 A Reolink user, with his genius recreation, makes Reolink Argus®2 almost invisible by hiding it in a PVC pipe. He also adds a solar panel near that wire-free security camera so that he can run the outdoor wire-free IP cameras even without concerning the power supply. In addition to painting security cameras black with sprays or painting materials, another solution is to camouflage IP cameras with vehicle vinyl wraps and other tapes as well. Since such tapes come in solid forms, they are easier to deal with and apply compared to sprays or painting materials. 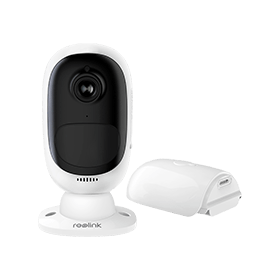 Moreover, they are affordable and durable, which makes them another preferable option for you to camouflage white security cameras. 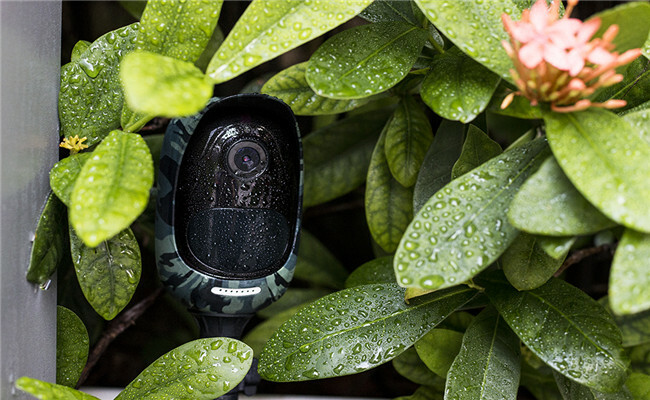 For some small-sized security cameras like the battery-powered security cameras, you may also add camouflage skins to make them less noticeable. Also note that applying camouflage skins which are not produced by security camera brands may come with inaccurate sizes and bring bad effects on the infrared lights or image quality. So, it is best to check if the security camera brands offer customized camouflage skins or not. The answer largely depends on how you paint your white security cameras. 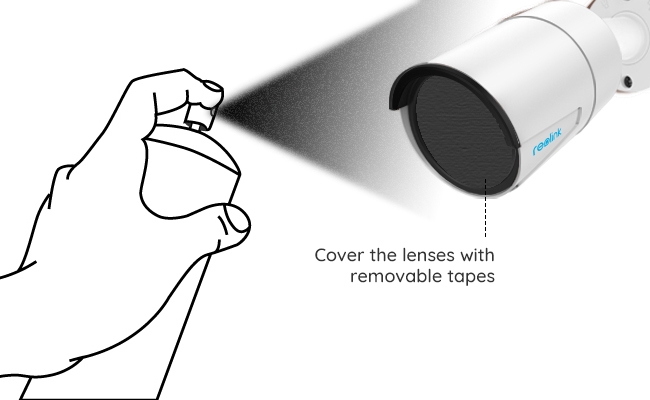 In fact, if you have covered the lenses, charging and alarm ports properly, you can spray painting IP cameras or apply other painting materials without any damages on the image quality or motion sensing. But note that painting white CCTV cameras black may disable the warranty. If you are not sure about it, consult the security camera brands before converting the IP cameras into black ones. Also mind that after the painting, you’d better choose proper installation spots with shelters for security cameras with dark colors. As noted above, if such CCTV cameras are exposed to the direct sunlight, they will possibly absorb extra heat and damage the unit. We would like to hear from you right now! If you have any ideas on painting security cameras black, feel free to share in the comment below. This entry was posted in How-to Guide and tagged camouflage security cameras, disguise security cameras, paint white security cameras black, painting security cameras. 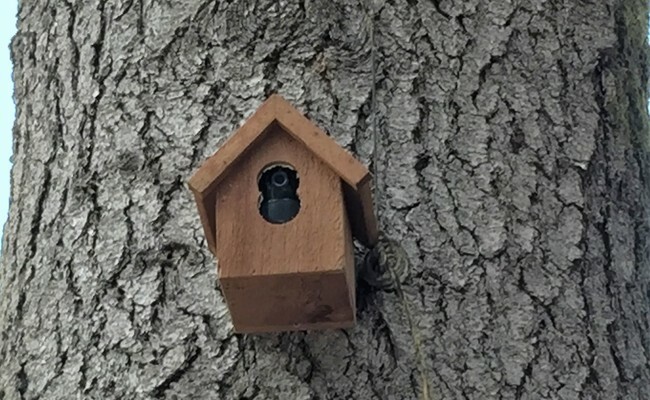 I placed my solar charged Reolink camera inside of a bird house and mounted the house on a pole with the solar panel on top. No one noticed the camera but I’d receive compliments about the bird house.